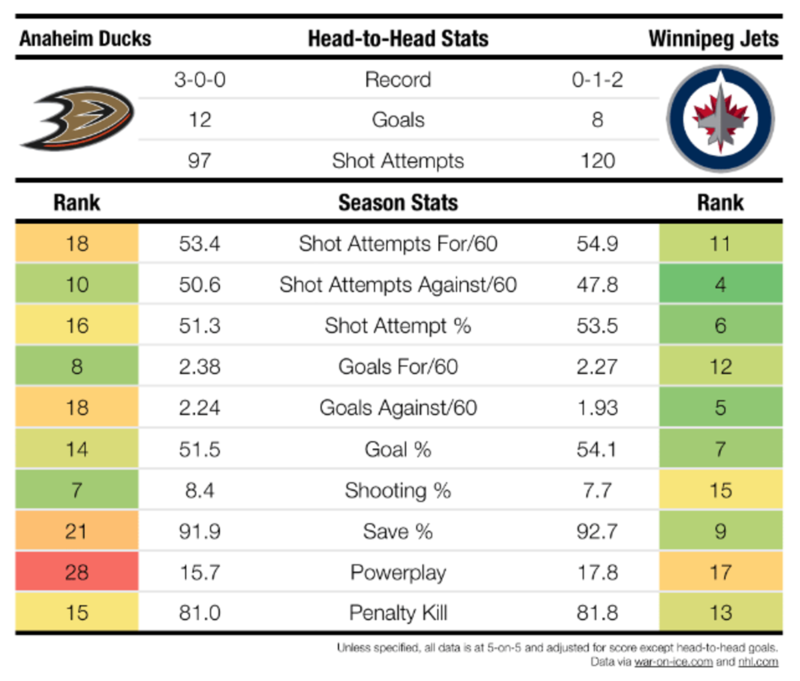 The Anaheim Ducks have been one of the most dominant regular season teams for a few years but the Winnipeg Jets are going to be tough to knock out in the first round. Jets goaltender Ondrej Pavelec has been on fire over the past month and if he keeps it up, it could be the difference in the series. DUCKS: Though it may sound counterintuitive, the Ducks win when players other than Ryan Getzlaf and Corey Perry are scoring. That’s because it’s a given the dynamic duo will produce with regularity. But it takes more than two prolific offensive players to win against the big boys of the NHL. That’s what cost Anaheim in the second round against Los Angeles last spring – a lack of balanced scoring. The addition of Ryan Kesler is a big boost to the second line and Matt Beleskey moved north of 20 goals for the first time, though 12 of them came in the first 26 games of the season. Anaheim has one of the youngest, most mobile bluelines in the league, led by Cam Fowler, Sami Vatanen and Hampus Lindholm. They’re adept at moving the puck efficiently and are crafty in the offensive zone. They’re also underrated defensively, as is veteran Francois Beauchemin. JETS: The Jets make for a miserable opponent thanks to their grinding style under coach Paul Maurice. 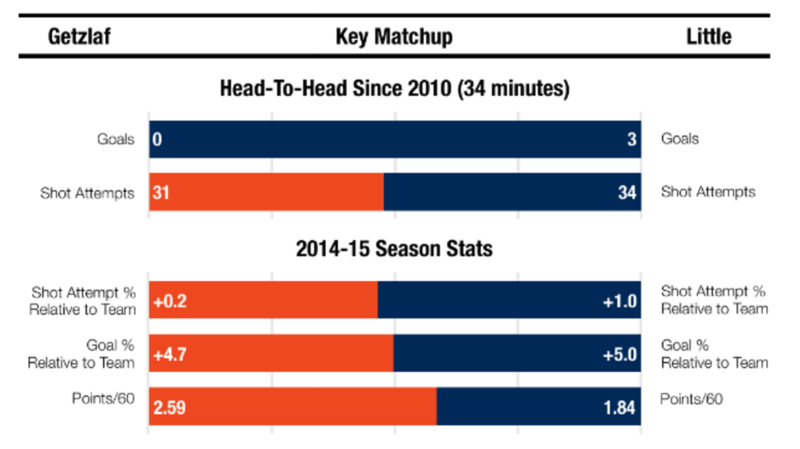 They’re a top-five SAT Close team, consistently the aggressor in generating shot attempts. Andrew Ladd and Blake Wheeler combine size and scoring touch on the wings, Mark Scheifele continues to develop as a two-way center and Michael Frolik excels in his checking role. The Jets ‘D’ corps, when healthy, is versatile and punishing. Dustin Byfuglien will earn a few Norris Trophy votes after a dominant return from playing forward last season. Towering Tyler Myers looks reborn after arriving from Buffalo in the Evander Kane trade. Jacob Trouba’s offense hasn’t sparkled like it did in his rookie year, but his bruising play suits the playoffs. And hey, goalies Michael Hutchinson and Ondrej Pavelec have both had hot streaks. Who’s to say one won’t in the playoffs? DUCKS: Make a list of the top 10 goalies you’d want in a seven-game championship series and, dollars to donuts, Frederik Andersen and John Gibson won’t be mentioned. That’s not to say the two young stoppers are doomed to let the Ducks down this spring. Just saying it’s one area where the team is vulnerable. Andersen and Gibson haven’t been as strong as they were last year when they made Jonas Hiller and Viktor Fasth expendable. The Kings executed on a plan last playoffs to limit the chances Getzlaf and Perry got, and it worked. Both are still going to get some shots through, but limit their numbers and you’re locked in a low-scoring game. Post-season opponents are bound to play a heavy game against Kesler and try to wear him down. The Ducks have several skilled forwards who tend to go missing when the traffic gets heavy. That has to change in April and May. JETS: The past couple months weren’t kind to the Jets. They endured injuries to streaking goal scorer Mathieu Perreault, not to mention Myers and Byfuglien. They are nowhere near as dangerous if ‘Big Buff’ isn’t healthy or if he’s playing hurt. He, Ladd and Frolik are the lone Jets with Cup rings. Most of the team’s core, from Trouba to Scheifele to Wheeler to Bryan Little, lacks post-season experience. The franchise has just one big-dance appearance since its Atlanta inauguration. It came in 2006-07, and only Jim Slater remains from that squad. The Jets have some outstanding offensive prospects on the way, from Nikolaj Ehlers to Josh Morrissey, but the current group struggles to score. The Jets got by on nail-biter victories earlier this season thanks to Hutchinson’s outstanding efforts, but his regression has really exposed their inability to outgun opponents. DUCKS: I have to think Frederik Andersen will be the Ducks’ choice in net come playoff time, but you can’t be completely sure it won’t be rookie John Gibson. Andersen began the season really well but then wore down somewhat. He’s a big guy – 236 pounds – and he plays at the top of his crease. There’s not a lot of net he gives you, and he’s got athleticism and aggressiveness on his side. Whoever is in Anaheim’s net will also have to adjust to a relatively new defense corps following the Ducks’ deadline deals. Getting accustomed to new teammates’ tendencies is important for any goaltender. JETS: Michael Hutchinson has been outstanding for the Jets. Like the Sens’ Craig Anderson, he’s tremendous when it comes to his anticipation and reading the play. Hutchinson does a lot of things well, and he’s a big goaltender. I played with Roman Turek, and he reminds me of Turek in a lot of ways, not just because they’re both lefties, but because he has the same type of butterfly as Turek and the same type of glove positioning. When Hutchinson drops down into his butterfly, it’s flush and it’s straight-up-and-down. Very square. He makes himself look big even in a butterfly. DUCKS: Frederik Andersen has been a nice source of counting stats for the Ducks but carries some playoff red flags. Injuries slowed him in February, he slumped upon his March return, and coach Bruce Boudreau has a strong fallback in John Gibson. Both goalies saw action in last year’s playoffs, and it could happen again. JETS: Is Dustin Byfuglien worth the gamble? Drafting him to your D-corps means gambling on his health and hoping for a Winnipeg upset over a high Western Conference seed. ‘Big Buff’ was a man possessed this season, however, and stands to rack up points and PIM as long as he’s in the lineup. KEY MATCHUP by Dom Luszczyszyn On paper, Ryan Getzlaf vs. Bryan Little seems like a No. 1 center mismatch, but they’re a lot closer than perception. Little is one of the most underrated centers in the league and the Jets with Little on the ice outscore opponents as much, relatively speaking, as the Ducks with Getzlaf on the ice. Little controls play slightly better, but Getzlaf is a factor in more goals scored. In the brief time they’ve seen each other in the past five years, Getzlaf hasn’t been a factor at all on the scoresheet. That’ll have to change if the Ducks want to get past these surprising Jets. THN PREDICTION: Anaheim in seven. READ THN’S OTHER ROUND 1 PREVIEWS IN OUR STANLEY CUP PLAYOFF FEED.